A UK Leading Supplier of Tamper Proof Labels! One of the UK’s Leading Suppliers of Tamper Proof Labels! 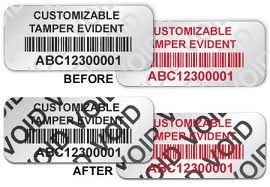 We manufacture to order a wide range of Tamper-Proof, Tamper- Evident and ‘Void’ labels. Plain or printed options available. These Labels are specially designed to be non transferable. This means they can not be removed or are exceedingly difficult to remove.